(from left to right:) Jim Wood's Max Objects workshop and Adam Burt's Podcasting workshop from TakeAway Day2 (Thurs 30 March). 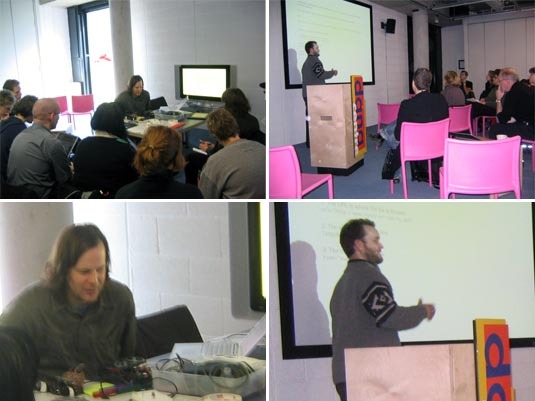 I actually attended Adam's workshop mainly because I have already had a number of Max msp lesson's with Jim. I learnt a number of things during Adam's session, not only about how to Podcast but also it was interesting to learn about people's perceptions about the general podcasting 'hype'. I mean let's face it, podcasting is little more than just audio on the internet which you can use RSS feeds to update content/episodes. Podcasting is another example of the way large corporations such as Apple are attempting to control what we are able to do with new technologies. During the workshop people were continually asking about the proprietary software such as itunes and quicktime, perhaps assuming that these applications were a necessary part of podcasting. Which is understandable that they might think that. I could feel myself getting increasingly wound up by these kind of questions and I tried my best to keep my mouth shut but I did evetually have to open people's minds to the possibility that there are plenty of opensource free tools which people can use to create their own pod/videocasts. Adam did a good job but I dont think there should have been mor e emphasis on the opensource philosophy which seems to underpin the TakeAway festival. The only other criticism I would have is that, I think there was an assumption that the audience would already be armed with certain technological know-how. So there were a few horrified faces when Adam suggested that people used the command line to make some basic changes to audio/video in prepartation for uploading!